This blog is a space for me to share my experiences as an MA student in Bristol. I’ll be documenting research and work related to my practice, tracking the developments and sharing my progress both in and out of university. I’d like to use this blog as another platform for building my creative network and welcome comment or feedback so please get in touch if you feel inclined! A brief update on my investigations into Drumcroon so far; through the call out, I’ve managed to arrange five interviews (three of which I’ve completed) and track down the location of the Wigan Schools Loan collection. I’ve also been loaned resources and sent the names of artists and staff that were involved with Drumcroon and the Artists in Wigan Schools scheme. The interviews so far have been fascinating and hearing about the work of Drumcroon and those involved with the centre and the scheme in Wigan has evoked a range of emotions. I’ve found links between the research and my own practice that I didn’t anticipate and had conversations that I feel will inform ideas and decisions beyond this extended essay project. Once the essay is complete I’d like to find some way of recording my findings and the key points about Drumcroon that I feel will feed back into my own work. I’m not in a position to share everything that I have found but I’d like to document my understanding of the centre and its work and find a way to provoke further discussion about it. I want to thank Wigan Archives for sharing the call out on their network and everyone and anyone who has shared the initial posts made on A-N and through social media. This blog is quite overdue! I’ve now been studying the MA in Multi-Disciplinary Print since September 2018 however my documentation so far has been very much offline. In time I will update this blog to reflect the work that I have been making and the things that I have been learning. Right now though I have chosen to reconnect online as I need some assistance. As part of the Masters, I am undertaking research for an extended essay and my chosen area of interest is the Drumcroon Education Arts Centre that once existed in the town of Wigan in the north west of England. 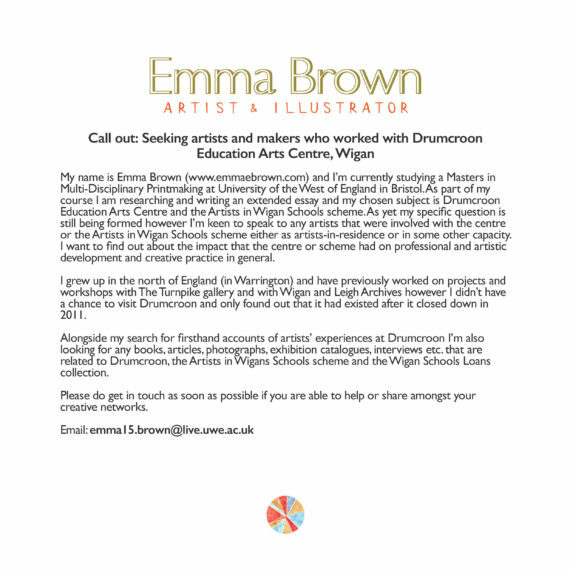 I have attached a call out for artists who worked with Drumcroon or were part of the Artists in Wigan Schools scheme that operated in the area in the 1980s and 90s. If you were involved in this or you know of anyone who was then please get in touch and share this call out! Emma Brown is a freelance artist and printmaker based in Bristol. Her work explores history, tradition, collection and place through a focus on narrative and an interpretation of this in visual form. In recent years her visual language has evolved, moving beyond representational illustration to incorporate abstracted impressions of objects and figures alongside automatic drawings responding to experience and emotion. This combination of elements creates images that are concurrently familiar and uncanny. Her working processes are driven by her illustrative skill-set combining drawing, painting, collage and traditional print techniques. 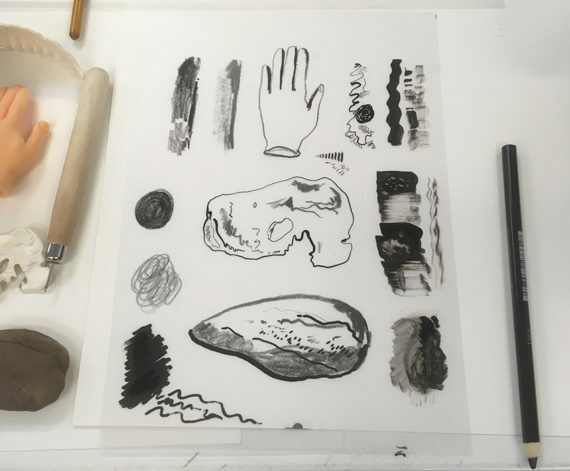 She is currently studying MA Multi-Disciplinary Printmaking at the University of West of England and developing her practice through reflection, discovery and experimentation.